Why all PR students should aspire to be geeks. 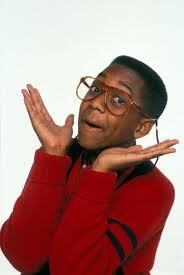 Steve Urkel from the TV show “Family Matters” is the ultimate geek and is probably an expert in social media. The Merriam-Webster dictionary defines a geek as “an enthusiast or expert especially in a technological field or activity”. Traditionally, this term would have been used to describe the likes of Steve Urkel or Sheldon Cooper, the scientific, computer wizes who got picked on incessantly at school and who none of us wanted to be. The thing is that they are the ones who become successful millionaires, owning companies like Facebook, Microsoft or Apple. What’s this to us cool PR people? We have the opportunity to be a little more like them… and we should take it! Here’s why. It’s no secret that biggest, most revolutionary change that has happened in Public Relations in years has been brought on by social media. No matter where we look there are books and journal articles talking about the advantages offered by these platforms with respect to engaging with the target audience, content curation and measuring results, among many others. Nobody disputes the fact that the future of PR lies within the infinite possibilities that social media has to offer. Why then is New Media not a mandatory module in the MAPR programs currently offered in the UK? Why are they not turning us into social media geeks? The fact is that this day in age knowing how to write a good tweet or an interesting blog post is just as important as knowing how to write a press release or a newsletter. Taking it a step further, it is equally important to know how to engage with the audience online as it is to “bait” a journalist into writing about our story. But for some unfathomable reason universities aren’t putting as much emphasis on these new, up and coming tools as they are on the traditional ones. The problem isn’t that they aren’t offering to teach students about new media, because they are. It’s that it’s offered as an optional module instead of being taught as a core subject. Students who, for a number of reasons, choose not to study new media will undoubtedly be at a disadvantage with respect to those who do. Not only won’t they learn the ins and outs of blogging or tweeting effectively. They won’t learn how to monitor feedback, or how to measure message resonation, or how to build online communities, or how to make a video go viral. Today in PR, this is like not knowing how to write a press release. a) Teach the students how to use social media platforms effectively while giving them practical experience which would make them more employable. b) Showcase the MA by posting content related to activities, visiting lecturers, etc., which could attract future students. c) Keep content up to date inexpensively, as it would be the students themselves who would be in charge of running these platforms professionally. So I say, put on your black rimmed glasses and your plaid shirt, grab your laptop and let out your inner geek! This entry was posted in Education, New Media, Professionalism, Social Media, Tactics, Tools, Trends and tagged advancement, engagement, Excellence in PR, Facebook, PR, PR Education, professionalization, Social media, Trends, Twitter by Luisa Garcia. Bookmark the permalink.